Obaidullah Aleem was born in Bhopal in 1939. One of the finest poets of Pakistan, he died of cardiac arrest in 1998. 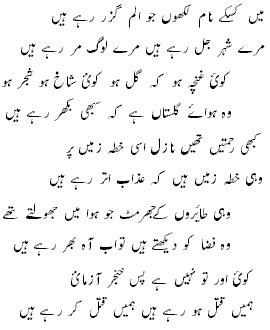 This ghazal puts forth the poet's deep anguish over the killings in the name of religion in Muslim world. Aleem belonged to Ahmedi sect and this verse can be seen in this context as well.